The Super Kite is an ideal all-rounder for those using big kite fishing rigs in strong wind areas. The super kite provides the best strong wind performance of all of our kites, they have often been flown in winds over 70 knots! This delta kite is constructed from top quality sail cloth and incorporates a carbon fibre centre spar and has dynamically balanced fibreglass wing spars and a hardwood dowel cross spar for safety. The dowel is the weakest and cheapest spar and protects internal struts from damage under extreme loads. Best performance is in moderate or fresh conditions, stable flight right through to gale force winds. 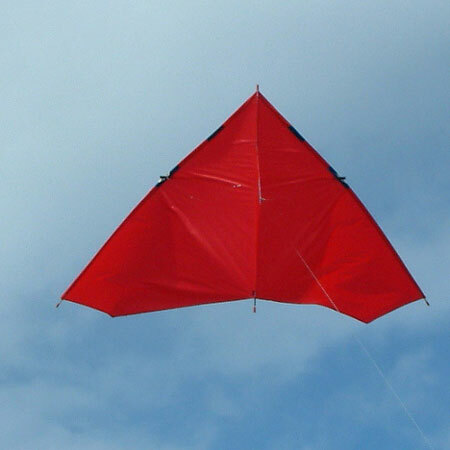 This kite is suitable for all 50 to 100kg breaking strain rigs. The Super Kite is also perfect as an only kite in strong wind areas like the east coast of the South Island or the Wairarapa Coast. Keen west coast kite fishers should certainly have a super kite in their kit to enable them to fish very strong winds on the leading edges of tropical lows and cyclones. 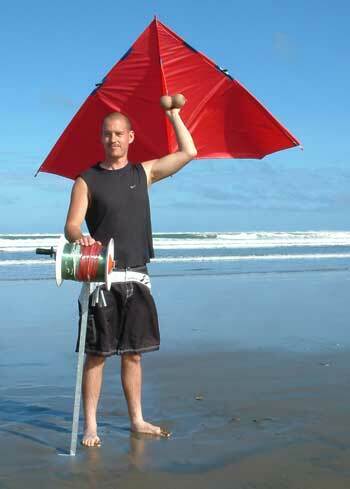 We know of no other delta kite that can fly in stronger winds. Fishing when the storms are approaching is perfect kite fishing weather. The sea is usually flat, the winds strong and the fish come in very close to feed. Another benefit of fishing in low surf conditions brought on by strong offshore winds is that the longshore current is at it's lowest strength. The red super kite in the pic on the left has the floats fitted to the keel and the beach fishing reel is a 1800 metre 100kg longline rig on a Mega Reel. Note : Reel, mainline and kite floats are sold separately.